2. Can anyone register for the Bengals? Our league is based on territories. Our territory boundaries are highlighted in the picture below in Orange (click on the map for a new window to open with a bigger map). 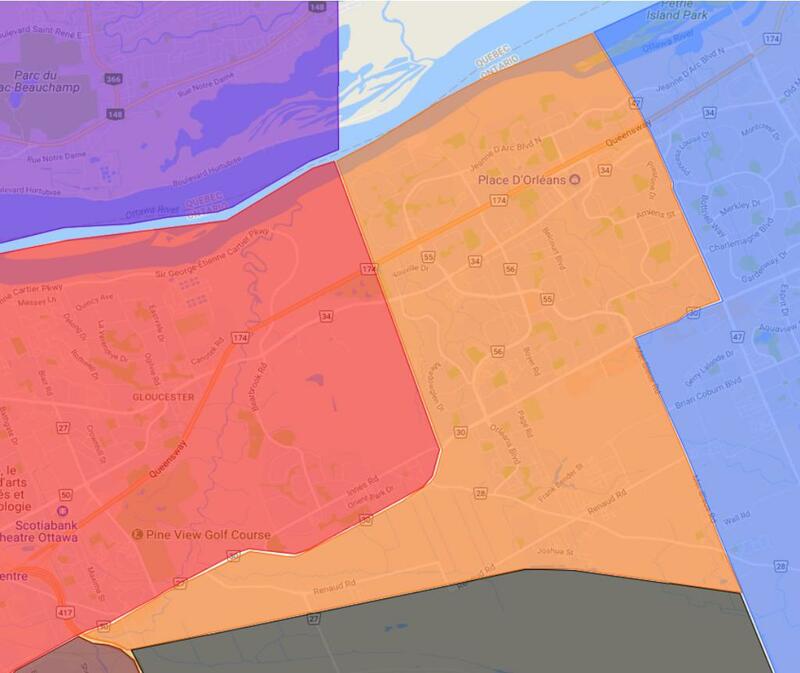 Unless you are a returning player to the Bengals, K4A postal codes, Fallingbrook and Avalon are Panthers territory. Blackburn Hamlet is Giants’ territory. If you are unsure of the territory you belong to, please contact us providing us your address and we will be able to direct you to the appropriate Club. 3. When does the season run? Our Spring Camp, which is run without equipment, consists of a series of drills to get players comfortable on the field if it is their first time playing or to get them back into the swing of things following the offseason. Spring Camp is optional and begins in mid-May. Our regular season camp begins in July. More precise dates can be found in the Calendar section of our website. The NCAFA season runs from mid August until the end of the October. Championship Week is played the first weekend of November. 4. What are the ages/divisions for the football players? Eligibility is based on the year of birth. For the 2019 season, Tykes will be 2010-2012, Mosquito 2008-2009, Peewee 2006-2007 and Bantam 2004-2005. For the 2019 season, the registration fee is determined by the level. Our Tyke level's fee is $325. From Mosquito to Midget, our registration fees are of $425 until April 30th. Begining May 1st, fees will increase to $450. Discounts are available for out of town players, siblings as well as for any players you refer who makes his/her team roster. This fee includes all the games and practices, and the loan of the football equipment. There is an additional $500 deposit for the loan of the helmet and shoulder pads. Cheques can be made out to the "Orléans Bengals" and dated September 15th of the current year and will be returned to you at the end of the season when you return your equipment. 6. What equipment is needed? The Bengals provide the helmet and shoulder pads. Each participant will need to purchase a pair of football cleats, a pair of black integrated pants and a mouthguard. Equipment can be purchased at the retailer of your choice. If you purchase these items at Lacroix Source for Sports on St-Joseph Boulevard, mention that you are with the Bengals to receive our Club discount. Registration can be done in-person at one of our multiple registration sessions or can be done online through the Bengals website. No player may take part in any on-field activity until they have been registered in our online database. This is an insurance issue and is non-negotiable. Players must also be registered with the Ontario Football Alliance (OFA) in order to be covered by our club insurance. Please go to http://ontariofootball.ca/page.php?page_id=83927 or follow the link on our home page to register. 8. Are there tryouts to make a team? Yes and No. Roster sizes are limited; therefore, tryouts are based on the number of players who register each year. 9. Is there a fee to tryout for a Bengals team? There is no tryout fee; however, there is a $200 non-refundable amount as part of the registration fees. 10. What happens if I am cut during the training camp? If a player does not make a Bengals team, the refundable portion of the registration fees are returned, as well as the deposit cheque for equipment once it has been returned. Yes, everyone plays. The NCAFA constitution mandates that all players play at least 4 downs per half at Tyke and Mosquito, 3 at Peewee and no minimum at Bantam. 12. How many players are allowed on a team? Roster sizes are set by the league at a maximum of 36 for Mosquito, Peewee and Bantam and 45 players at Midget. Our Tyke program is a 6 on 6 program and each team is capped at 20 players; however, Clubs are permitted to field more than one Tyke team. 13. Where, When and How often is practice? Our home fields for practices are Garneau High School as well as St-Matt's High School. All practice dates are included in our Calendar. - Tyke practiced twice a week on Mondays and Wednesdays from 6:00 pm to 7:30 pm. - The Mosquito and Peewee teams practiced Monday, Wednesday and Thursday from 6:00 pm to 8:00 pm. - The Midget team practiced Tuesday and Thursday from 6:30 pm to 8:30 pm at Garneau High School. 14. When will I get my child’s schedule? The full schedule for the NCAFA season is available on the NCAFA website. It will also be posted on the Bengals website and shared with our coaches and parents once it is finalized. 15. Do I need to remain at the practice field with my child? YES. Think Safety! – Football is a contact sport. Injuries are not common, but they do occur and parents need to be present at all times. If you need to leave the practice for any reason, it is mandatory to have an emergency contact present during practice hours in the event of illness or injury. Please ensure that another parent is responsible for your child before leaving the premises. The coaches are not responsible for injured players. 16. What do I do if I have questions/concerns/problems? Each team has a team manager. He/she should always be your first point of contact for any issue you might have. If they do not have the answer, they will direct you to the appropriate Club official. 17. When does my child’s equipment need to be returned? The date for equipment return will be communicated with parents before the end of the season, usually one week after the final game. Equipment not returned at the designated time will result in deposit cheques being cashed. 18. How will we know when football practices or games are cancelled due to weather conditions? The Bengals will only cancel practices when the weather poses a danger to the players. Examples include, lightning or extreme heat. Practices are NOT cancelled for rain. Team managers will communicate this information to parents as soon as the decision is made, should the practice be cancelled. 19. How do you select coaches? Coaches are selected each year after an interview process and approval by the Club President. 20. Do your coaches have any training? All of our coaches are volunteers, but we do ask them to take training classes. All coaches with the Bengals attend mandatory league orientation meetings to ensure they adhere to the mandate of the Club. All of our Coaches also complete an online course entitled Making Headway which addresses the proper protocol to follow in case of a head injury, as well as being Safe Contact certified by the Ontario Football Association. Finally, all of our coaches must obtain a Police Record Check every two years which is held on file with the Club. 21. I am interested in coaching. How can I become involved? Any individuals who would like to volunteer for coaching need to contact the President, George Zigoumis at georgezigoumis@gmail.com. 22. What if my child is injured during a game or practice? Each team has at least one trainer (first aider). They will assess the player and determine what action, if any, is needed. Emergency crews will be called if parents are not present. 23. How can I help? The Bengals are run entirely by volunteers and your help is greatly appreciated. For each home game, each team manager will be asking for parents to volunteer as a stick crew, convenor, time keeper, score keeper, to help with the BBQ/Canteen, to run our 50/50 draw and finally to help us set up and tear down at the end of the day. 24. When will pictures be taken? An announcement will be made a few weeks prior to pictures being taken. Parents will have the opportunity to purchase packages. Forms will be posted on the website. 25. Will there be any fundraising? As a not-for-profit, we are able to keep our fees low through various fundraising activities. Although helping with fundraising activities is not mandatory, any help parents can offer is always appreciated. 26. Who can I contact if I have questions? You can send an email to bengalsorleans@gmail.com. 27. How will I stay updated on Bengals information? Announcements will be sent via email, through our website and posted on our Facebook page. NO communication will be done by telephone except in very specific circumstances. 28. Are parents allowed on the field? For insurance reasons, parents are NOT allowed on the field during a practice or game unless they are official team/Club volunteers registered with Ontario Football. There are no exceptions. 29. What paperwork will I need to complete? Please refer to our "Registration" section for all of the details. No player will be allowed to participate in the training camp unless all paperwork is in order.